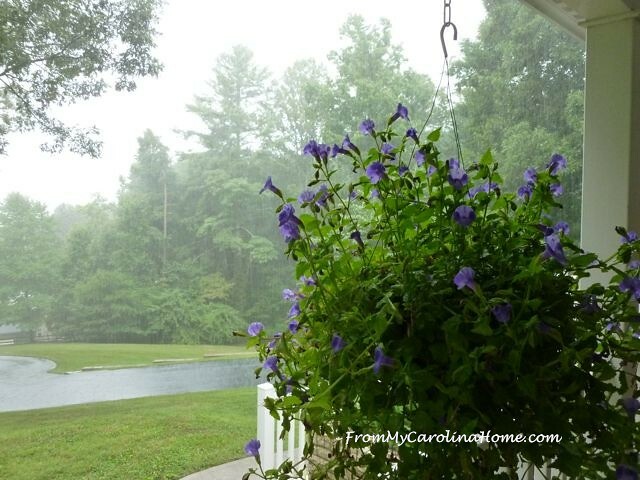 It has been cooler the past couple of days, and Saturday afternoon brought a nice rain shower. 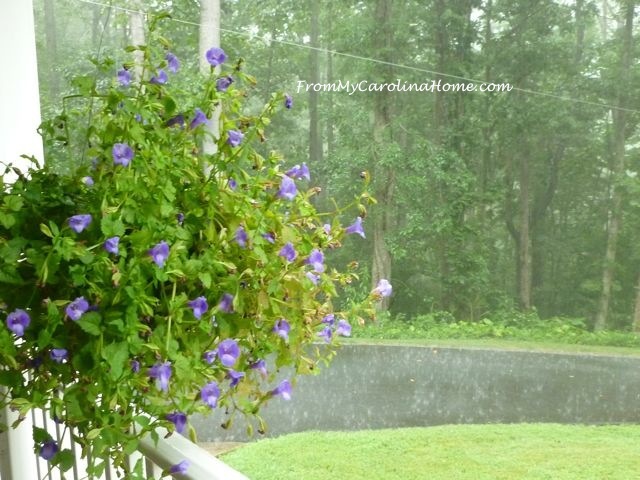 I had gone out to water the hanging baskets and the plants under the eaves when it started. 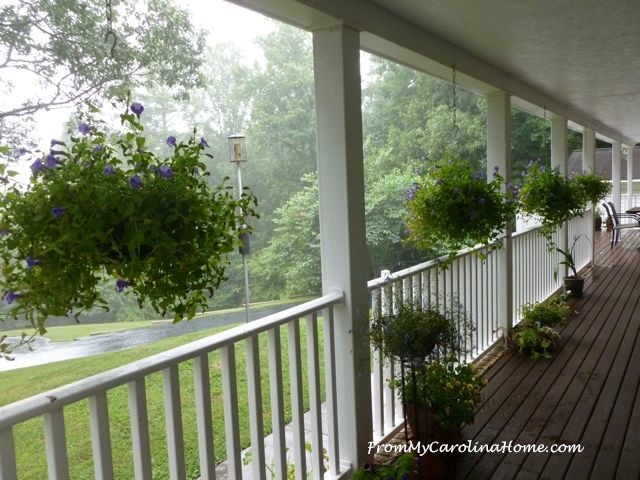 There is something wonderful about sitting on the veranda in the rocking chairs while it is raining. 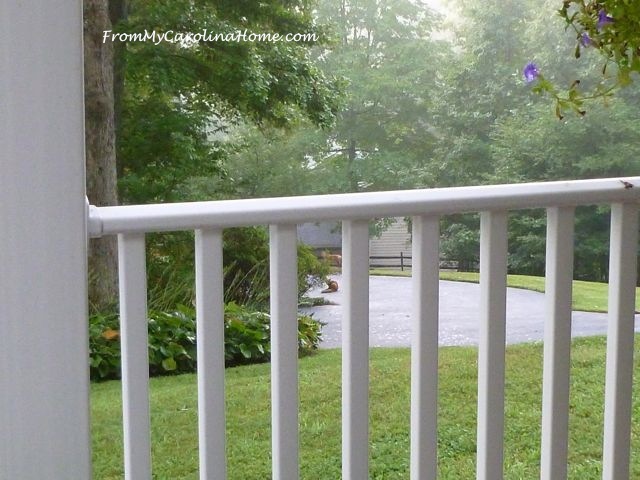 It is a perfect place to read, or just watch the rain, while the fog and clouds cover the valley. 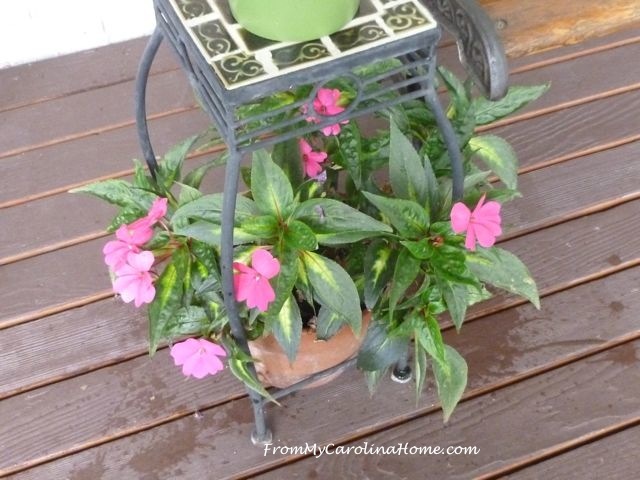 Those New Guinea impatiens continue to be prolific bloomers, keeping the little tables stable for holding a glass of iced tea. 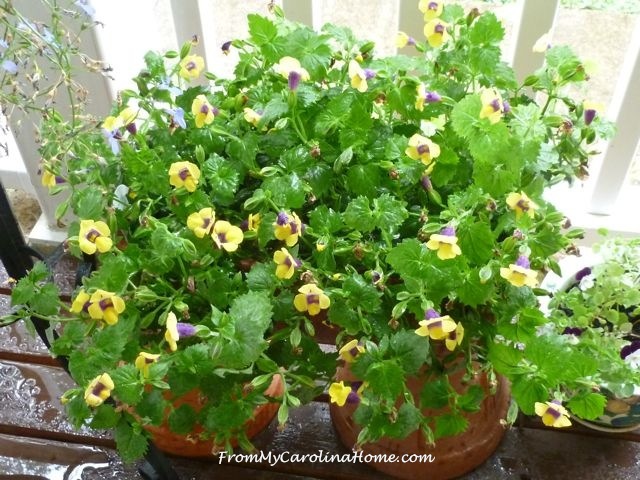 The yellow torenias continue to grow and bloom, and are spilling down over the inverted pots I used to raise the level of their container. 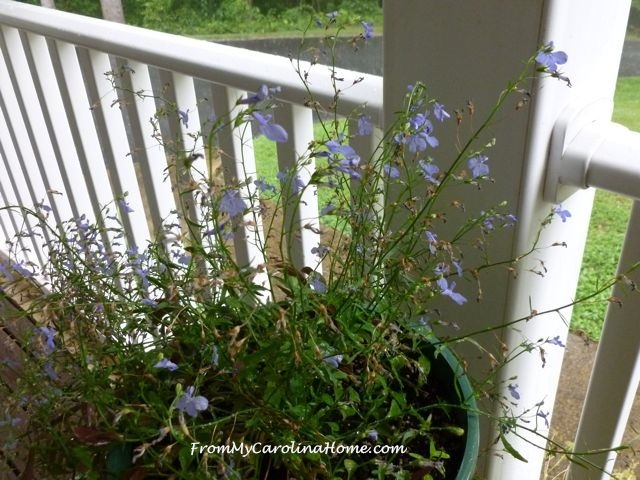 The lobelias are almost done. The white one has turned brown, while the blue flowered one is still hanging on. 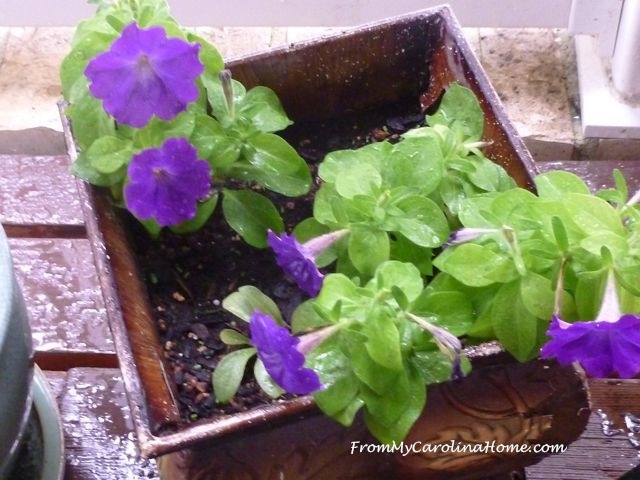 These little purple petunias are still going, even though they usually don’t last this long. Cooler temps have encouraged the little johnny jump ups to bloom again. It kept on raining for a while. I really enjoy a gray day. Look how huge the torenia hanging baskets have grown! The real surprise came early Sunday on a foggy morning. DH noticed the foxes were back, playing in the meadow. He grabbed the camera and got one photo of them. Look between the slats of the railing in the middle, they are both there. One is sitting on the driveway, the other is above at the edge of the meadow standing and looking at the camera. Amazingly beautiful animals!! What do you like to do on a rainy day? These flowers Brightened my day! What do I do on a rainey day? I scrapbook & make Stamping up cards! Loved your photos! I love to sit on the porch on a rainy day, rocking in a chair that looks much like yours. We don’t see foxes, but we have warring hummingbirds for excitement. Carole, your flowers are spectacular! Flowers have always caught my eye, but when I began growing them they all hold a special place in my life. 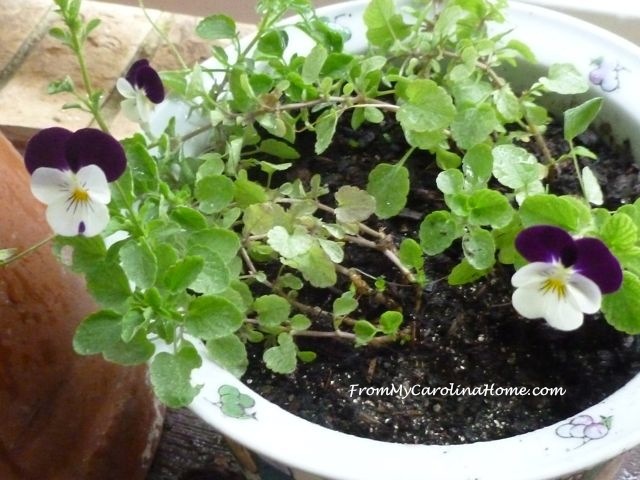 It is relaxing and fun to watch them grow and even fade as the winter approaches. I especially was swooned by your Impatients. Their colors and where you have them displayed really is beautiful. My Naked Ladies (well one of them) have finally decided to begin the next stage and the naked stem with the bud is about 6 inches now. I will have to take some photos and post them. Your front porch is magnificent! Oh, I would pretty much live on it from spring until late fall. LOL. Great shot of the foxes! Our two mates just appear late at night usually and we seldom get a glimpse, we know that they had another litter this spring though…extra tiny prints. Thank you for sharing and have a wonderful creative day! you have a really very beautiful property. I love the porch. On rainy days, I usually like to clean, or get out in it and get some annoying errands/shopping done. 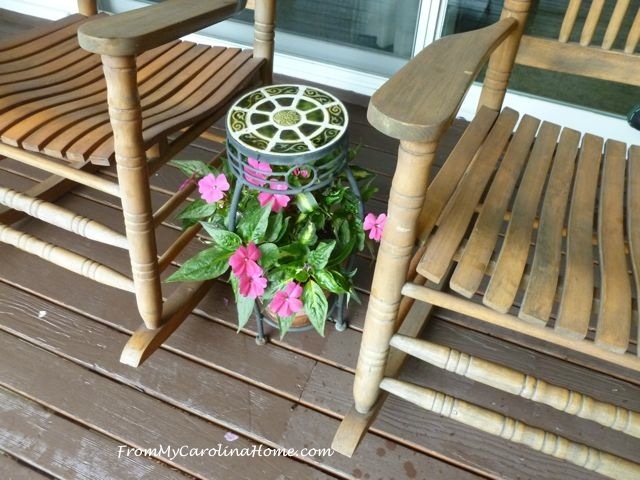 Your flowers are beautiful and I love that porch!!!! On rainy days I like to set up by art supplies by the window or patio door and get creative while watching and listening to the rain…and then sometimes I curl up with a good book while listening to the rain . Love your porch. Looks very inviting with the garden in front and the lovely pot plants. If I’m not out and about battling the rain (and probably swearing under my breath and an errant umbrella) I will almost certainly be at my sewing machine. I have it set in front of a pair of glass doors, which in turn open out onto a paved area and then garden. In the near distance is a large body of water. Its spectacular watching the bad weather come in from the south and over the water. Rainy days are my favorite time to sew. My sewing machine faces a window so I can peek out it as I sit there. I too just love your porch!! Oh and rainy days!!!! I love to have on my favorite pair of jeans, slippers and a comfy sweater and just love being home! Oh that little fox was kinda adorable…. It is starting to rain here in AR. Has been thundering for an hour. I like to lie in bed with blinds open so that I can see the lake, just steps from my deck. Until a couple of years ago, I hated rainy days. I was a sun goddess. Tanned to perfection. Now a good book and rain keeps me Content all day!!!!! Your flowers and deck are wonderful. Thanks for sharing.